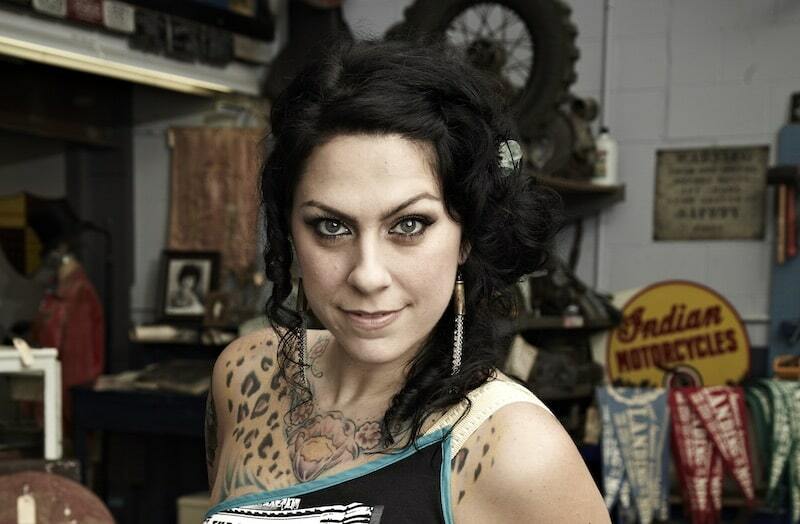 On this week’s episode of American Pickers called “Hello Jell-O”, the team splits up as Danielle Colby heads to Vermont while Frank Fritz and Mike Wolfe are down in Louisiana. The series began in 2010 and is one the crown jewel hits for History Channel. We first met pickers Mike and Frank who then introduced their office manager Danielle Colby as part of the team. Danielle was in charge of the nuts and bolts of Antique Archaeology in LeClaire, Iowa, while the guys were road tripping. As the show grew in popularity, a second storefront opened in Nashville, Tennessee. Danielle’s position and importance in the success of the show have also expanded. Colby is a true fan favorite, one part devoted Midwestern mama, one part Rosie the Riveter and two parts of steaming hot Bettie Page. Her look is rockabilly meets a sultry siren of yore and her rising popularity has allowed her to explore other business avenues and even consider producing film projects. All of this enhances her unique brand and cements her as one of America’s favorite on-air TV personalities. American Pickers is a top show for us and we love the team of Danny D, Mike Wolfe and Frank Fritz, as Danielle tethers them to the home ship storefront while doing the legwork and research to point the guys in the right direction. But she has also become a righteous picker and has a wealth of knowledge from hands-on exploring in the country’s tucked away spots, learning on the job and researching to make win-win deals with people who watch the show and reach out to connect, for business and emotionally as these pickers respect and appreciate that sentimental backstory that always accompanies a collection someone is ready to relinquish. Monsters and Critics: Danielle, we have followed you for years on American Pickers. One of the amazing values this show promotes is the value of well-made things, and cherishing the older collectibles that still work and have a purpose. What category of ‘smalls’ is your own favorite to hunt for when you hit the thrift and church basement sales? Danielle Colby: For cheap buys, power packed with character, I like children’s toys. I’m crazy about frozen charlottes. I used to collect a lot of skeleton keys. I had a huge collection for many years. I’ve just recently begun to sell that collection off. You can always find really interesting keys for not a lot of money. Anywhere from five dollars to hundreds of dollars. You can collect them at all price ranges. M&C: You have a stunning presence. Please talk about who does your ink, and the designs you have so far and anything you plan on adding? DC: Well, thank you kindly! What a great compliment! My friend Patrick Cornalo, who owns Speakeasy Custom Tattoo in Chicago, Illinois, does my work. He constructed my pagan suit of armor on my chest and stomach. We have so much more planned out. He has a great vision and I just trust him. He knows what belongs on my skin, I give him a theme and he creates around it. I have some very visible pieces from Alex Strangler as well. Including my Frida on my right arm. And a couple great little bangers by Oliver Peck here and there. There are some other lovely artists in the mix as well. DC: He loved his momma like Elvis did. She was his everything to him. M&C: We all know Mike is obsessed with bikes since childhood, what is the larger category of collectibles you geek out on? DC: I am completely and hopelessly obsessed with vintage stage costumes, specifically early burlesque. I have an extensive collection from all around the world, as early as the 1800’s. Including a very rare costume from Lillie Langtry of the 1890’s, an original early Mata Hari stage costume from 1910-20, and a banana skirt believed to have belonged to Josephine Baker. I have a full collection of lesser known dancers costumes as well. I love playing history detective with those. I get to hunt down history on the dancers myself. It’s a project that consumes my every waking moment. When I’m not filming for American Pickers, I’m researching, writing and hunting for these costumes so that these unknown dancers become known dancers. Women don’t just give their lives over to striptease for no reason at all. There is always a very specific and pointed reason why a woman will feel the need, urge or desire to remove her clothing on stage in front of tens sometimes hundreds of people and if she’s really successful, thousands of people. Some of which love her, some of which judge her. I want to know the “why.” I have studied this art of dance for over ten years now in hopes of better understanding the answer to this question. Everything about this project really lends itself to a better-educated understanding of women throughout history. I ask myself questions such as, ‘What makes a good girl a good girl? What makes a bad girl [a] bad girl?’ Is a good girl just a bad girl who hasn’t been caught? Is a bad girl just the girl who grew up in a more complicated situation? And why do we need to draw a distinction between the two? Can’t a girl just be a girl and have both of these elements in her personality and still be a well-respected citizen? These are the types of questions that I seek to find answers to and the collection of these costumes helps me do just that. M&C: You have such a centering energy on the show. Talk about how your career with Mike and Frank progressed. You knew Mike before the show was even on the air…where did you start, where are you now? DC: Ha! I think that’s why he keeps me around. We met at a yard sale about fifteen years ago or more. We have been friends ever since. M&C: I love how you use your social media as a mini primer and visual smorgasbord for women’s history and notable achievements. Talk about your side interests apart from the TV life, what else is your passion? DC: Women’s studies intrigue me. I want to know everything and I love to read. I will read over socializing every time if I can get away with it. I love running and circus arts too. I have the mind of a six-month-old pit bull. I need to run myself hard to satisfy the amount of energy that I have. That’s my passion; finding bliss in every situation through exercise and education. M&C: What are some unique Iowa idiosyncrasies with regards to picking and collectibles? Is Iowa a hotbed for certain things? DC: Iowa is great because the prices are still reasonable and Iowans keep everything. Overall, it’s a magical city for finding great collectibles. M&C: Where is your favorite part (or parts) of the country for the abundance of high-quality Americana? DC: My favorite part of the country to go picking is out east! It is so much fun and you can find so many incredible items! Outside of the United States, I love Paris. Picking in Paris is like nothing you’ve experienced in the states because the history is so much older and more power packed, especially for the history of striptease and Burlesque, which I mentioned are great interests of mine. M&C: What are some hot items right now that you guys are really on the hunt for? DC: Rarities, petroliana, and automotives are what the guys look for consistently. M&C: What is the status of the documentary about legendary burlesque performer ‘Tempest Storm’ you mention on your website daniellecolby.com? DC: We are in the process of shopping around the completed film now. It’s an amazing story of a legendary queen who is dancing her way through a very modern world and her personal take on life. The vulnerability that comes through in this film shocked even me. Tempest is a very well-guarded Hollywood type figure who stays very quiet about her personal life and any struggles therein. This film allows her an opportunity to delve into her personal struggles and her personal life and come to understand her own actions and the consequences of them; for the good and for the bad. There’s a really beautiful moment where this queen allows herself to reflect on an incredibly tumultuous life, and in the film, it appears to be the first time she’s ever done that publicly. She was beautiful and talented and influential. She kept the company very famous men, as did many of the more famous Burlesque stars of that day, but at what cost? Tempest Storm was not a feminist, not in any way, shape or form. Yet she had a huge impact on feminism today. M&C: Best advice you ever got was…? DC: When in doubt, love. M&C: Best advice you ever gave? Even in the midst of a heated argument, if you take a moment to try and understand your opponent’s perspective and where they come from you can often times avoid arguments and sometimes even gain people’s respect and bend their understanding in your direction, even if just for a moment. Sometimes people just need to know that they’re not being judged and that they are loved and that they matter in order to see through the haze of nonsense that clouds all of our minds and makes us think that we are exclusively right and someone else is exclusively wrong. If you think about it, there’s very little right and wrong in the world. Instead, in my personal opinion, it’s more a matter of what’s convenient for one person as opposed to what’s convenient to the other person. We need to try a little bit harder to love each other and be willing to understand from another person’s perspective. Love is universal.